Vintage Indian blue and green patchwork pillow with Irish linen cushion. 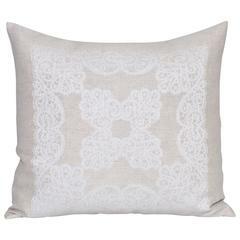 Beautiful ethnic pillow (cushion to our European customers) in an exquisite vintage handcrafted and colored design. A striking symmetrical patchwork pattern of simple yet dramatic shapes and motifs in soft natural dyed cotton delicately handstitched in a traditional appliqué technique upon a rich tan background. Backed in fresh, new 100% pure Irish linen, the aristocrat of textiles and certified by the Irish Linen Guild, lined in a layer of natural bamboo wadding, filled with new plush duck feather insert and a concealed zip. The traditional oatmeal color linen is a combination of the unbleached raw color of the natural flax plant on the weft intertwined with pristine white on the warp, resulting in a beautiful mottled effect. A contemporary cushion (pillow) constructed with antique elements by using fragments of precious fabric hand-picked by Katie in Jaipur in Rajasthan, an area known for its textiles. Handcrafted in Ireland By designer-maker Katie Larmour Design Studio Color: Saphyre, pale and duck egg blue, navy, tan, ochre, emerald green, grey, rust, orange.